As we wrote Tuesday, the ABC daytime talk show kicked off the week with a substantial overhaul of its set and graphics, which had itself come on the heels several smaller changes that included a new desk and changes to the on-set graphics that had been completely redone for the new season. In this latest change the “cubbies” on the side walls are now rotating through various colors. 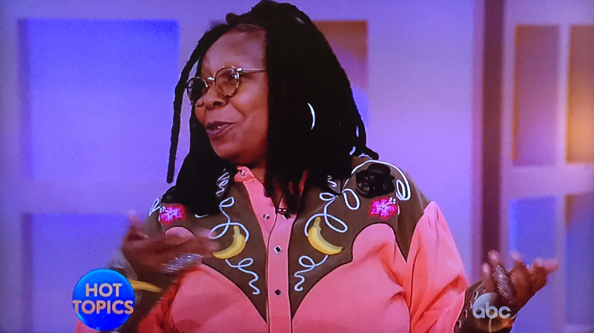 A good example is shown above, with the wall behind moderator Whoopi Goldberg in the midst of a transition. So, in short, “The View” can now actually change this part of the set while it’s on the air. We just hope there isn’t someone at ABC monitoring social media and responding to what viewers think of the set. Can you picture it? So … we’ll ask again: How long until the show dumps the “cubbies” for full out video walls?